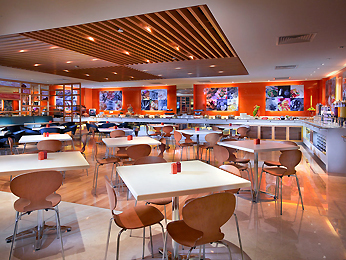 The restaurant serves an international and local menu between 12pm and 10:30pm. 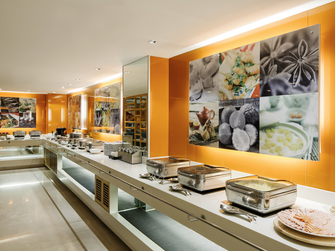 TASTE also serves a decent buffet breakfast from 6am to 10am. 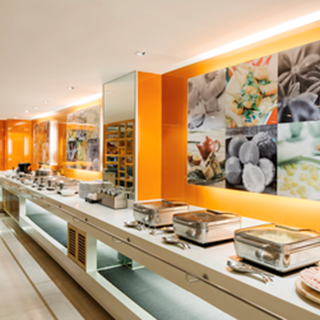 TASTE is the flagship restaurant and bar of the Ibis Hotel on Bencoolen, and the food "is about simply trying everything". The restaurant serves an international and local menu. TASTE also serves a decent International buffet breakfast. Not recommend food taste terrible does not replenish food regularly. Food container always empty. Variety wise less than 10 items. Not worth the money. We have a great time with our friends from Canada. The food is good but not many varieties and should include coffee or tea ( at least for the first round). Your Waiter Ned is so friendly and his service was good. Will visit again. Pleasant cafe for casual dining but the food varieties could have been better. Service, ambience and pricing excellent.food was not to my taste and was not topped up when we were there although they did top up appropriately. Terrible food spread for a $14 buffet. Your advertising is very misleading. There were only 6-7 dishes for selection and service is very slow for the manual stations like rojak and popiah. I would suggest you suspend your buffet to keep some good will. Staff were very friendly and helpful. Decent food at reasonable prices. I came here for the Nasi Lemak buffet with my colleagues. Overall it was alright, 6.5/10. We felt that they could use more variety, use less frozen foods, and cut down on the lemongrass in the sayur lodeh. The keropok also has an odd and fishy oil taste. But the Nasi is really good though! The variety is not competitive with summerview hotel café opposite, where they offer at net price with more dish variety. They have dessert, fruits, tea/coffee. The staff needs to be a little better trained. The host did not know about reservations and made my wife and sit wherever there was a free table. Luckily the manager on duty came by to seat us properly. The toilets need a keycard but then the keycard was not working. Might want to look into that. It was not a nasi lemak buffet. The amount of food catered was really little. Especially, the fried chicken wings. The manager gave excuses to why they are not preparing more. Tries to justify how it was worth it for my money already. I mean anyone was to buy something from anywhere, it is themselves who can justify whether it is worth it. I suggest, maybe stopping the nasi lemak buffet, because it is misleading. Very nice dining experience food is good and value for money. Looking forward to further promotions in the near future. 1. Add-on amount for drinks. 2. What we see from the food review and the actual differ. 3. Chicken wing was not top up despite several walk to check up. We have a group of 8 went to try the Nasi Lemak Buffet in the restaurant and while I appreciate the restaurant team to be versatile and fast to transfer us to another table as we have additional 1 headcount. The services thereafter is really a disappointment. First of all, we are given plastic cutlery and when I probed further, was told that there was not enough metal cutlery. We cannot apprehend how can a hotel runs a restaurant with not enough cutlery. In addition, there are some empty tables with the metal cutlery which we cannot understand why they cannot be given to us since there was no customers? Secondly, we have to ask a few times for drinking glasses and obviously it is under staff in the restaurant and on top of that, there is another company function at the other side of  restaurant which the bare minimum staff have to manage as well. Last but not least, the plastic wrapping was not removed from the gado gado section and we have to do it ourselves. The peanut sauce for the gado gado should kept warm since the vegetables for the gado gado were cold. What we have encountered is obviously not the usual services I got from other Accor Group's hotels. Although Ibis Hotel is not a 5-stars hotel like the other Accor Group's hotels, I felt there must be a minimum service standards. Everything was bland and tasteless, from the nasi lemak rice to the sayur lodeh, curry chicken and even the sambal - everything had no taste ! The gado gado tasted slightly better, but all the ingredients  were ice cold, like they had just been taken out of the refrigerator - certainly wasn't very pleasant to eat. Went with a group of 4 other colleagues and ironically everyone said the best item in the buffet was the jelly drink with green apple bits. How sad. Overall the food not bad. Service was good. Highly recommended. Worth the price paid. Dear Sirs, how are you? I suggest a larger selection in the menu especially deserts. Beef Rendang - only fav. I went for 2nd. Chicken wings -  salty, oily & crust are felling off. One is enough. Sayur lodeh - needed improvement. We left in 20 mins & what you think? The nasi lemak buffet was value for money and the food was above average. The beef rendang was tender and delicious. Service was impeccable and efficient. Plates were cleared regularly and drinking water replenished without asking. Will definitely return again. Excellent value-for-money nasi lemak buffet lunch. I'll be back for sure ! Should have a little more variety for the nasi lemak buffet but still value for money fish is nice. Service was excellent. Staff serve with a smile.